The other day I got to properly play a PlayStation 4 for the first time round my friend's house. I have to say, the console is a really awesome bit of a hardware (the controller in particular is very nice), and now all Sony need to do is impress me with some truly great exclusive games and the console will have my approval. I haven't had a chance to play the Xbox One yet, so I am still far from deciding which console I favour over the other. Then again, the most recent systems I own are that of the sixth generation, so I better get myself a PlayStation 3 or an Xbox 360 before I even begin to think about the current generation. 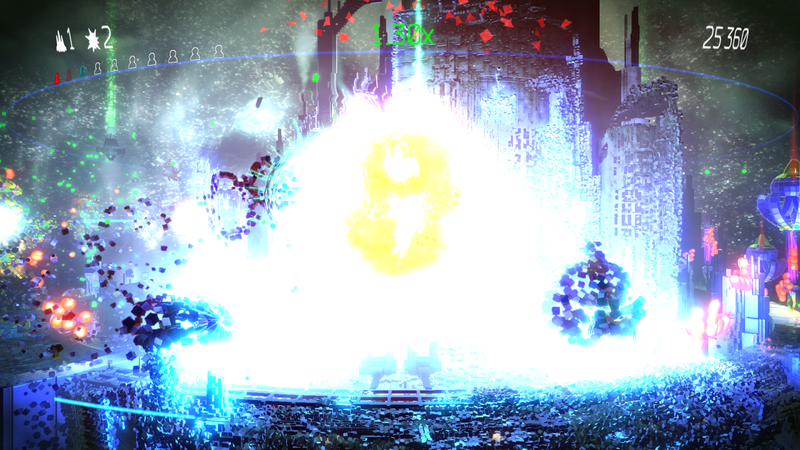 Anyhow, me and my friend played Resogun, one of the two games you can download for free with a PlayStation Plus membership (the other being Contrast), taking turns to play it. 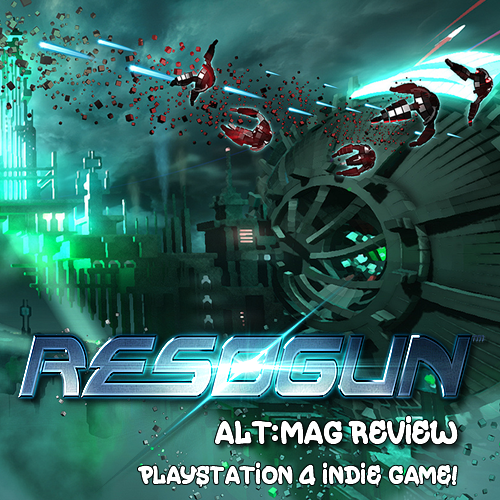 Anyone who follows the indie gaming scene will probably know that Resogun (developed by Finnish indie developer Housemarque) has been causing a bit of a buzz as not only is it a PlayStation 4 exclusive, but it has been getting many positive reviews. And I must say, playing it, I definitely believe the hype. The game is a side-scrolling shoot 'em up game and is a spiritual successor to the games Super Stardust HD and Super Stardust Delta. 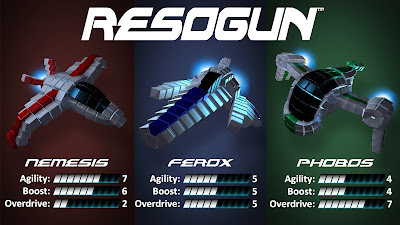 You fly around a rotating cylinder as a little spaceship (you can pick from a few different ones, all with different advantages and disadvantages) with the simple goal of fighting off hoards of colourful and bizarre enemies and, as the game informs you at the beginning of every level, to 'SAVE THE LAST HUMANS'. The game's controls are pretty simplistic and make use of the controller's analog sticks very well, with the left analog stick being used to move up, down, left and right, while the right one is used to shoot left or right by pushing it in one of those two directions. The only other buttons that are used are the shoulder buttons for throwing humans, a boost, and two power ups, while the D-Pad and the Cross, Circle, Square and Triangle buttons aren't even used at all. Smooth simple controls like this really make for a laid-back gaming experience, and it is easy to enjoy the game while focusing on multiple things, like talking to a friend or something. But what stands out the most in Resogun is the graphics, they really take advantage of the PlayStation 4 hardware and look fantastic through 1080p. 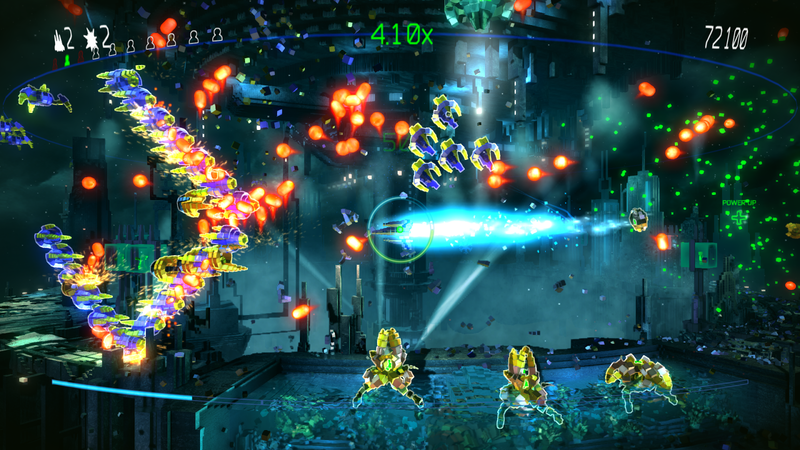 The game's colours are vibrant and beautiful, and the dark backgrounds provide a perfect contrast to the vivid colours in the foreground. The music is also worth a mention. It isn't distracting, but it still stands out in all its techno glory, fitting spot on with the overall 'sci-fi' feel of the game. I personally liked it, as it reminded me of the music from Tempest 2000. There is also a bit which shares a similar melody to that of 'All Your Base Are Belong To Us', seriously have a listen for yourself. 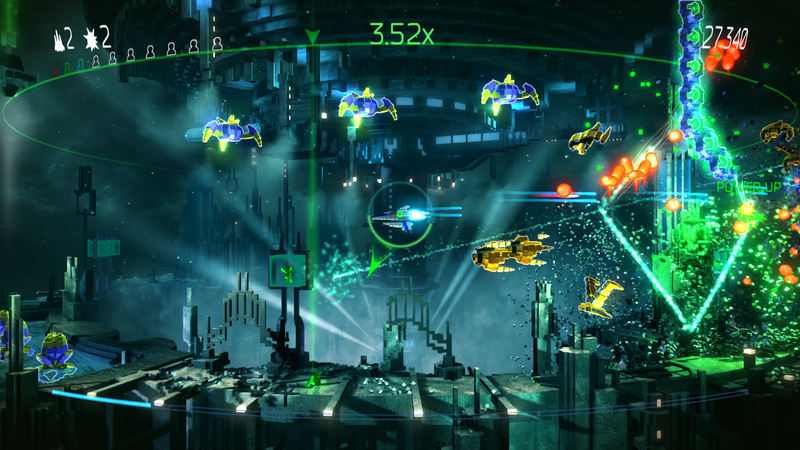 The gameplay is more or less derivative of the traditional shoot 'em up games that we all know and love, and Housemarque have been developing these type of games since the early 90's, so they are no newbie when it comes to the genre. 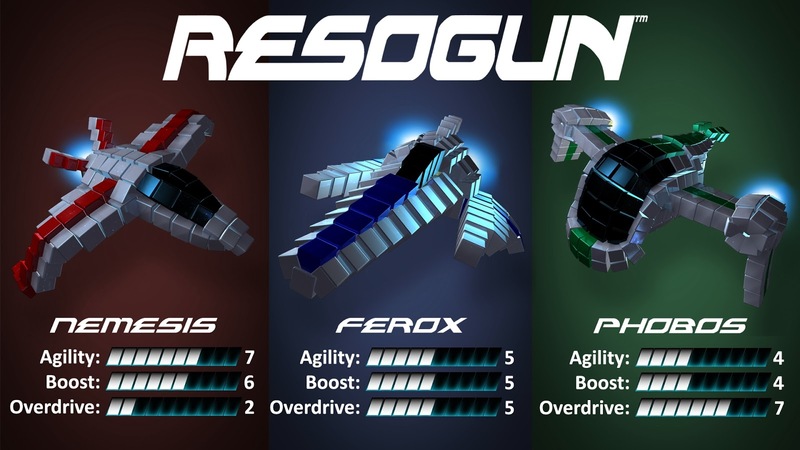 Hoards of enemies fly at you and you have to shoot them. There are a few phases that you have to pass through, and then there is a boss at the end which is usually looks bloody awesome, and destroying it is really a visual sight to behold. 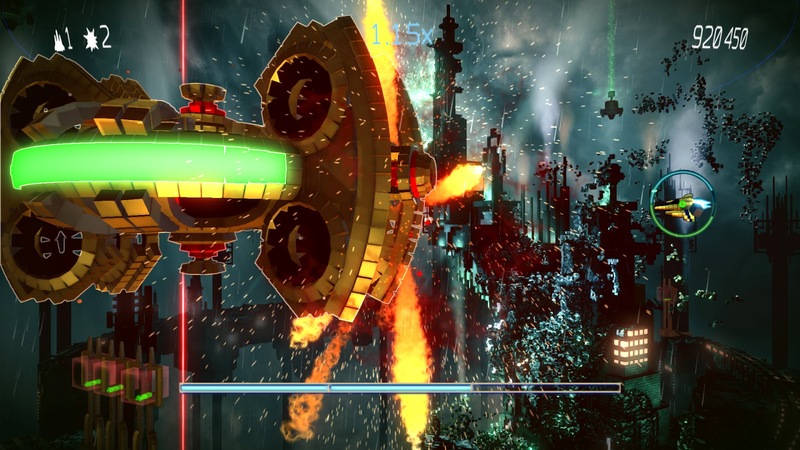 Around the third level the gameplay does increase in difficulty, with more enemies turning up to try and stall your progress. It is nice to see a bit of challenge cause if there is one thing about some newer games, they are a little bit too easy for my liking. Although it seems that saving the humans is a big part of winning the game, they only really count towards your high score. As you zoom around the levels, you notice that there are rows of humans standing in little boxes. They are only released when the boxes start to flash and you collect enough green dot things to free them. The problem is though without any instructions, it is hard to figure out how to save the humans and half the time you constantly keep being told 'HUMANS LOST', and you're all like "what? I was looking all over for humans?" Eventually you figure out what you're supposed to do but even then it is still hard because you can't kill enemies quick enough to collect enough green dots. Also, when caught up in the action, you don't notice that there are humans running around on the bottom of the screen, when really you should be trying to save them. This was the main gripe I had with the game. Overall though, Resogun is a right beaut of a game, and is definitely a great game to get for free if you are a PlayStation Plus member. 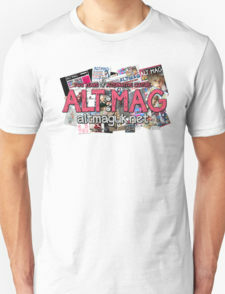 If you aren't a member however, then be prepared to fork out 12 quid for it, which I would say is reasonable. Although if you aren't willing to pay that much, I'd wait until they put it on sale or something, which is more than likely what will happen. It is definitely something decent to pass the time while you wait for some more games to be released on the system.